The Charlotte Hounds haven’t had the best success in their Major League Lacrosse season openers, but they were just seconds away from ending that. However, a few mistakes proved costly to the Hounds, who lost to the Rochester Rattlers 10-9 in sudden-death overtime Sunday afternoon at American Legion Memorial Stadium. Jordan Wolf scored four times for the Rattlers (1-0), including the game winner just over two minutes into the extra period to give Rochester its fourth straight win over Charlotte, dating back to the 2013 season. Charlotte native Mike Sawyer scored three goals for the Hounds (0-1), including a goal with 1:43 seconds remaining that put Charlotte ahead 9-8. Charlotte then worked the clock down, but Hounds defender Brett Schmidt was whistled for holding with six seconds remaining, giving the Rattlers a power-play opportunity. Rochester capitalized quickly, with Jeremy Boltus scoring with 2.9 seconds left to force the extra time. Wolf’s goal gave the Rattlers the win with 7:58 left in overtime. There were some bright points for the Hounds, who are now 0-4 all-time in season openers – all coming at Memorial Stadium. Charlotte goalkeeper Pierce Bassett – taking over as the starter after Adam Ghitelman’s trade to the Boston Cannons – had 17 saves, while faceoff specialist Brendan Fowler was 16-of-23 against Rochester’s James Carroll. Terry Kimener, acquired in an off-season trade, had two goals for the Hounds. Four other players – Josh Dionne, Michael Ehrhardt, John Haus and Jake Tripucka – had one goal each, and Dionne and Thomas DeNapoli each had an assist. But the Hounds gave up those advantages with turnovers – 24, compared to 17 for the Rattlers – and penalties. Charlotte also allowed five power-play opportunities, which led to a pair of Rochester goals. “At the end of the day, it doesn’t matter how many times you stop them, you’ve got to get the win,” Bassett said. “Did we do some great things? Yeah, we did some great things. Did we do some bad things? Yeah, we did some bad things. 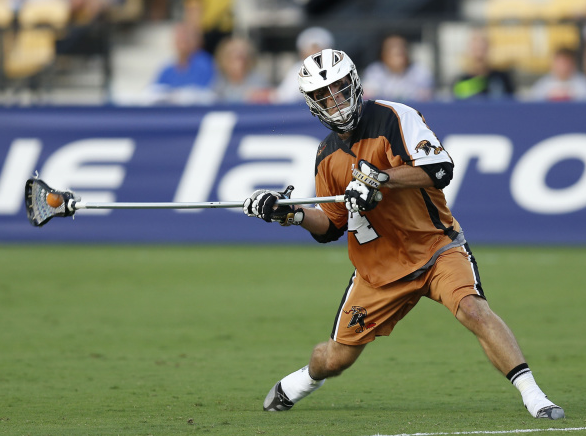 The Rattlers – who led the league with a 10-4 regular-season record last season, only to lose to the Denver Outlaws in the MLL championship game – had their bright spots as well. Boltus, picked up from the MLL supplemental draft, had three goals for Rochester. Dave Lawson added two goals and two assists, and John Ranagan had a goal. On the defensive end, John Galloway – last season’s MLL goalkeeper of the year – finished with 15 saves. The Hounds have a bye week, then go on the road to play the Boston Cannons at Gillette Stadium – the home of the NFL’s New England Patriots – in Foxborough, Mass., on April 26. The Rattlers take on their in-state rivals, the New York Lizards, in their home opener April 19 at SUNY-Brockport’s Eunice Kennedy Shriver Stadium in Brockport, N.Y.